It’s probably no surprise that satirists have had some waspish things to say about satire. Peter Cook described his satirical nightclub ‘The Establishment’ as “loosely based on the Berlin cabaret of the 1930s, which did so much to prevent the rise of Adolf Hitler”. This line is widely quoted not least by the likes of television’s Stephen Colbert or songster Tom Lehrer on the question of satire’s effectiveness. On the other hand, there is the case of Rik Mayall who (at least on one occasion) credited Alan B’Stard, the character he created for TV series The New Statesman, with the downfall of Margaret Thatcher. He was advertising a new stage show at the time. I recall hearing an interview with Mayall in a more sombre mood, lamenting the way political events seemed to carry on regardless. Further to my last column, on misunderstanding satire, here is Mark Twain on the trouble he had getting people not to believe his satirical fantasias. Notice he declares that his intention was to eradicate foolish ideas like petrification mania or inflated dividends altogether with a rhetorical sally. As if, had he been understood, this would have happened. Without wishing to take him too seriously on that point: there speaks a writer of newspaper editorials. The ironical detatchment that often goes along with satire makes self-mockery seem almost inevitable. There is also a benefit in self-depreciation: it means you’re more likely to get away with making fun of others. It seems odd to even expect a practical effect. Normally we might think of the arts as describing the human condition rather than changing anything. But satire is not so much an art form as the use of some art for a rhetorical project: condemning its target. So it should be judged by the effect it has on the minds of its audience. But if we don’t expect much from art in itself, that’s partly because, here in New Zealand at least, we live in settled times. Tyranny seems naturally suspicious of the arts; basically part of their general suppression of free speech. Arts practitioners worldwide have been know to take a kind of quiet pride in their fellows’ persecution. But if the tyrant reasons that satire is a danger to the state, it may be simply because it constitutes or can do open opposition, not because of what the satire might actually achieve. Laughter is often seen as an opposite to dogma, as if the laugh were the sound of ideas being shaken round in your head. This article on subversive Burmese comedians the Moustache Brothers quotes Czech writer Milan Kundera, who should know: “No great movement designed to change the world can bear to be laughed at or belittled. Mockery is a rust that corrodes all it touches.” We might think of the murderous monk in Umberto Eco’s The Name of the Rose, killing to prevent the effect a vindication of comedy might have on religion. In the case of satire the supression will also be encouraged by vanity. It’s tempting to think of cartoonist David Low’s appearance on Hitler’s death list in these terms. As is the way with cartoonists, Low would satirise the policies of leaders by appropriate depictions of their persons and Low did not take kindly to Hitler’s policies. Hitler needn’t have been offended for his own sake to want rid of Low, who aside from opposing Nazism from well before the war, was also adept at producing images designed to keep the British spirits up. Propaganda is typically dull reading the satirical approach can make your opinions or observations more interesting and more palatable (even if it’s the sugar coating on a knife in the back). So there’s that. But in a day-by-day context there are any number of ways to be despondent about the potency of satire. As I said previously, changing people’s minds is a problem. The less they agree with you, the smaller the chance they will understand, let alone appreciate, the satire. It seems like politics is more and more openly played as a game of words rather than actions. This sounds like satire’s home turf. But the spin doctor’s phrases are there to make it easier not to think something that satire demands, both for interpretation purposes and often as a goal in itself. You can guess which has the bigger audience. Even if one can influence the way people think, or draw attention to certain issues, there is fair evidence to indicate this won’t necessarily effect what they do. In terms of directly influencing those in power, I have had a politician quote on of my pieces back at me (once). But I can’t say I noticed any effect on his behaviour. One doesn’t ask; they certainly wouldn’t tell. 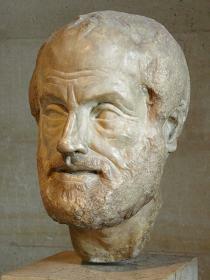 The book at the centre of The Name of the Rose was the lost volume of Aristotle’s Poetics on comedy. Aristotle’s analysis might be expected to parallel his thoughts on tragedy, which he saw as purging unhealthy emotions and making for better citizens. Unfortunately for the satirist, another way of describing this state is ‘complacency’. In the thirties Berlin that Peter Cook referred to, Bertholt Brecht was inventing political theatre; he tried to remind the audience of the artificiality of the play and the political implications of the story, and to leave them unsatisfied to encourage them to fix the world (choosing communism for preference) and not pretend it had been put to rights by a play. Brecht’s collaboration with composer Kurt Weil produced, among many other things, the song “Mack the Knife”, which was later used for a McDonalds jingle. As Peter Cook (and others) observed, Hilter took over Germany. Some time after that, Brecht’s theories gave rise to political street theatre, and we all know how effective that is. I don’t know if anyone’s put even that much thought into satire. Learning about history we see these huge social movements beside the various images in words or pictures that seemed to define their essence. From the formation of the United States we might think of Thomas Paine’s revolutionary pamphlet Common Sense or Ben Franklin’s famously unfunny ‘Join, or Die‘ cartoon. Satire is a tool suited to this task it could almost be defined as art with a practical focus, and its comparisons and juxtapositions allow one, through comparision, to be remarkably specific. For all its irony, an apt satire is a peculiarly direct way to make your point. And to accurately identify your enemy if as a particular though or action rather than a specific person. Yet one can’t help noting that, of the images of that kind that leap to mind, propoganda and journalism (especially, in the 20th century, photography and video) outnumber examples of satire. I remember the war against Franco, That’s the place where each one of us belongs! Though he may have won all the battles, We had all the good songs! A yet, I do consider someone like anti-fascist collagist John Heartfield (warning: link includes praise of me) or the Moustache Brothers as heroic, their work necessary. If only to prove to the universe that there is some sanity in this species. How else it might matter remain more a more soft and human question. For all that satire might be polemic in fancy dress, the most prominent satirists of today are professional entertainers. Especially in a medium like TV they will probably incline to choose a laugh over a point, both by temprement and for careers reasons. We are not warriors in anyone’s army. And that is not trying to be self-deprecating. I’m proud of what we do. I really like these two shows. I like making ’em. I like watching them. I’m really proud of them. But I understand their place. 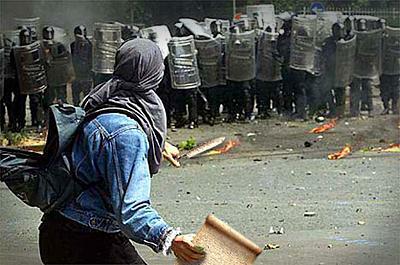 I don’t view us as people who lead social movements. Satire needn’t be funny. But let’s not underplay the value of comedy. Every time a man smiles, but much more so, when he laughs, it adds something to this Fragment of Life. During the 2005 election campaign, I was talking to someone involved at the sharp end. It’s a very stressful business. He asked me what I would be writing that week: “We don’t care if it about us. We just want a laugh.” I recall a certain desperation in the tone. A little joke to suggest it’s not so terrible and the world will not in fact end and you don’t actually have to take yourself so seriously sharing some of that chronic sense of perspective that seems to fit nicely with comedy. It’s that Aristotle thing again, but in a good way. Or – bear with me that Nietzsche thing. In Neitzsche’s theory of tragedy we reconcile ourselves to the uncaringness of the universe by making it into a story a tragic narrative. One imagines comedy can work the same way, by making it into a joke. This may or may not leave us with the will to change things, but it surely leaves us happier. I haven’t dealt with the victims of actual tyranny but I imagine they need a laugh too, if not more so. There is one practical benefit satire has had for me: it’s educational. When you make a joke about the real world, it’s a good idea to provide some background. So reading The Onion’s Our Dumb Century with an invented newspaper front page for each year of the 20th century taught me a lot about US history. The Daily Show’s America: The Book is actually written as a parody high school text book with revision questions at the end of each chapter (‘What does “bicameral” mean? Are any of the girls in your class “bicameral”?’). 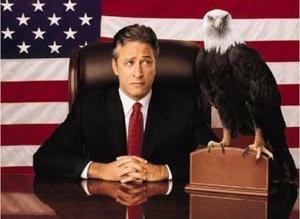 In fact, examinations of The Daily Show have found it to be as good (or no worse) a news source as actual TV news programmes. Also, a 2007 Pew poll rated Jon Stewart among America’s most admired journalists, though that may say more about Americans than Jon Stewart. At the beginning of World War Two David Low published a collection of his cartoons with commentary as “a simple statement understandable to the meanest intelligence of what had lead up to the war” so that the masses could have something other than platitudes to work from. It proved popular, and a later collection also covered the course of the war and its aftermath. There’s that Low again, undermining my argument. 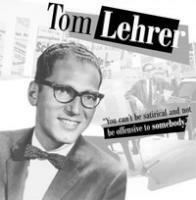 It’s said of Tom Lehrer that he gave up satire when they gave Kissinger the Nobel Peace Prize. Actually he had already stopped – it seems he was a satirist who was not addicted to the laughter – but he did say that the award made political satire obsolete. But it turns out the story that he invented the jelly shot might actually be true. The Naval Base rules said no alcoholic beverages, so he and a friend came up with an alcoholic foodstuff. Perhaps there is something to be said for encouraging a satirical frame of mind.